Fan favourite Dawson Simpson has put pen to paper on a new one-year deal. The GIANTS have re-signed five players for the 2019 season while farewelling Ryan Griffen, Tim Mohr and Lachie Tiziani. Dawson Simpson and Lachie Keeffe join rookies Dylan Buckley, Jack Buckley and Jake Stein in re-signing with the club for next season. 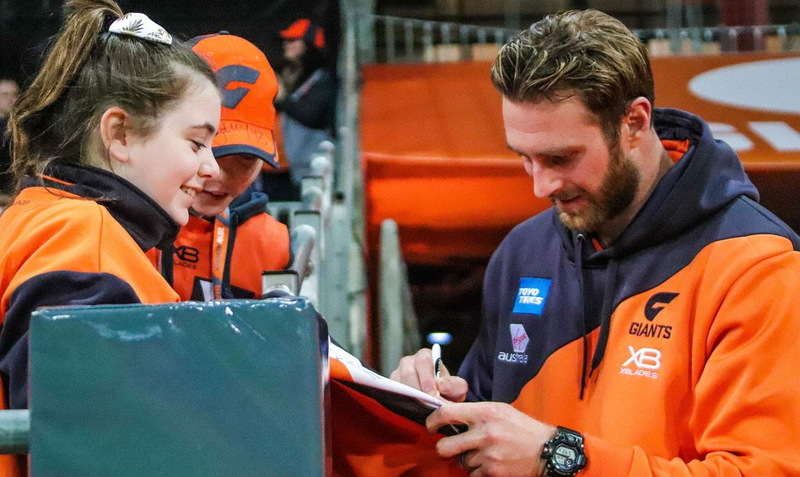 Ruckman Simpson had his best season in GIANTS colours in 2018, playing nine games as the team’s number one ruckman before suffering a season-ending ankle injury. Versatile defender Keeffe played eight games for the season, including the semi-final, while small forward Dylan Buckley made two appearances in the orange and charcoal in 2018. Local rookie forward Jack Buckley and former Decathlete-turned-defender Jake Stein are yet to make their AFL debuts but showed impressive NEAFL form across the season with Stein taking home the NEAFL Development Award at the Kevin Sheedy Medal. The GIANTS farewelled 257-game veteran Ryan Griffen following the end of the season while young forward Lachie Tiziani and defender Tim Mohr have not been offered new contracts. “We thank Lachie and Tim for their contribution to the GIANTS during their time with us,” said List Manager Jason McCartney. “Tim has been with us from the start and was an important player during our early years as he notched up 48 AFL games, which is no small feat. “Lachie’s a great young Academy kid who showed some positive progression earlier in the year before unfortunately suffering an ACL injury. The NAB AFL Trade Period saw the departures of Dylan Shiel, Tom Scully, Rory Lobb and Will Setterfield with the GIANTS taking an extremely strong draft hand into this year’s NAB AFL Draft. The GIANTS hold picks 9, 11, 19, 25, 52 and 89. The NAB AFL Draft will be held at Marvel Stadium in Melbourne across November 22 and 23.